Going through the statistics of Wednesday’s game, he found one very much to his liking. Tuchel was thrilled to see PSG had won 71 percent of their tackles in the first half. Although it was achieved against mediocre opposition, it underlined the relentless intensity he is trying to instill. Tuchel has two strong holding midfielders in Italy’s Marco Verratti and the homegrown Adrien Rabiot. Both were industrious against Red Star and Rabiot, in particular, has adapted well to Tuchel’s demands, cutting out self-indulgent aspects of his game and playing with more urgency. PSG has not progressed beyond the Champions League quarterfinals since cash-rich Qatari investors QSI took over seven years ago, and the players have sometimes lacked character in big games. Tuchel is trying to change that and is going about it differently to his predecessor Unai Emery. Emery, who had a tense relationship with Verratti and other players, seemed to be a distant figure, preferring a hands-off, disciplinarian approach. Tuchel — although strict on diet and time-keeping — appears closer to his players. 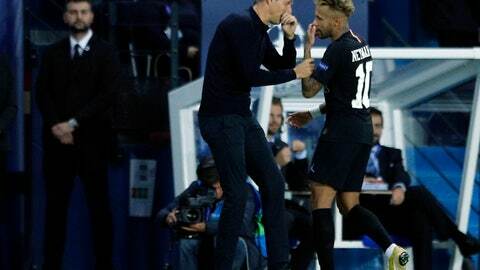 When Neymar came off the field to a standing ovation on Wednesday, Tuchel hugged him and spoke at length before offering him a pat on the back. Neymar grinned in return, his ego doubtless boosted. The Brazil forward seems to be thriving under Tuchel, his hat trick against Red Star giving him 10 goals in eight games this season. Neymar also seems more focused and tougher on the pitch . He reacts less when fouled and has cut out the play-acting and theatrics which marred his World Cup earlier this year. Tuchel thinks his striker has found peace of mind. Nice coach Patrick Vieira has left striker Mario Balotelli out for Friday’s match at Toulouse. Balotelli has lacked sharpness, failing to score in the three league games he’s played under Vieira. It was the French coach who persuaded the forward to stay at the club, after he was expected to join Marseille in the summer. Balotelli did not show up for the first day of pre-season training.